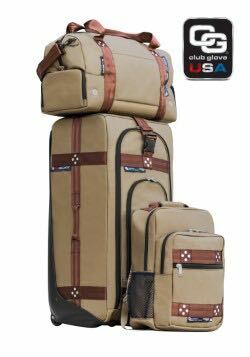 Club Glove unveiled their new TRS Ballistic color option, Desert Tan with Cinnamon webbing, at the 2019 PGA Merchandise Show (January 22-25). The premium luggage line that has dominated the PGA Tour in brand usage for luggage, had previously offered three color ways- all Black, Black with Bronze webbing, and Slate Grey with Black webbing. This new color option with elegant shades of luxurious beige and brown exudes a look of style and sophistication, while still maintaining the brand’s standards of American Made durability and quality. The new color combination caught both buyer’s and media’s attention at the PGA Merchandise show last month. Preorders for the new color option have been much higher than anticipated. The new TRS Ballistic Desert Tan and Cinnamon luggage is expected to release and be available for purchase in mid to late spring. For more information or to purchase please visit www.TRSBallsitic.com.